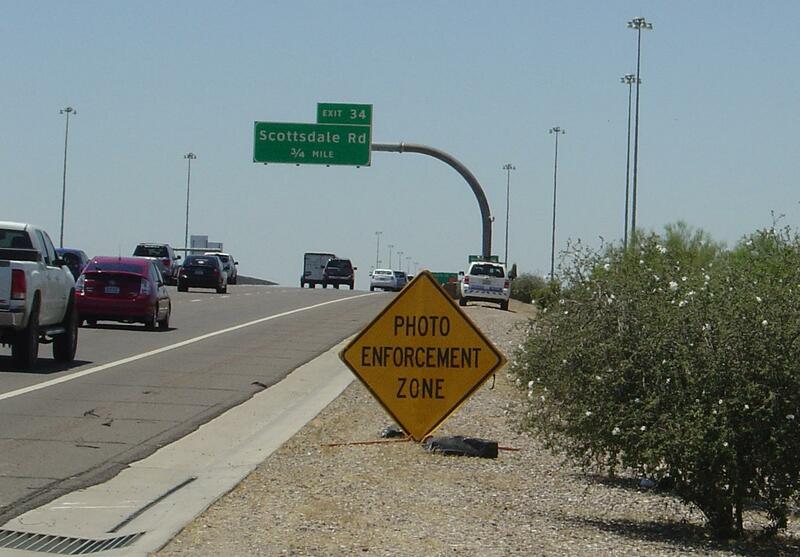 Redflex Violates State Law Regarding Signage… Again! Signs erected by a local authority or agency of this state as prescribed in this section shall contain a yellow warning notice and correlate with and as far as possible conform to the system set forth in the most recent edition of the manual on uniform traffic control devices (MUTCD) for streets and highways adopted by the director pursuant to section 28-641. 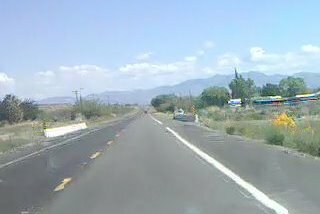 Page 582 of the latest MUTCD (Dec 2009) specifies that temporary signs such as the signs used at mobile speed vans must be at least 1 foot from the ground. Clearly, the sign in the photo is touching the ground. We didn’t measure, but it also appeared that the sign was less than 300ft from the talivan as required by the law. Our recommendation to anyone challenging their talivan photo tickets in court: Bring these photos and the MUTCD with you, show them to the judge, and then ask for first hand knowledge or witness that the signs were not just in place at the time of your alleged violation (not just at the beginning or end of a deployment), but specifically that they were displayed properly. Ask and demand to know at what height and distance the signs were displayed and if the technician actually measured or just eye-balled it, or if the sign was blown over at the time of the photograph. Do not allow speculation or generalities. If they cannot answer this question, demand that your ticket be dismissed under section D as they cannot demonstrate compliance with ARS 28-654. This entry was posted on Sunday, May 16th, 2010 at 10:14 pm and is filed under News, Redflex. You can follow any responses to this entry through the RSS 2.0 feed. You can leave a response, or trackback from your own site. So much for honest journalism. It goes to demonstrate what we’ve known for a while: it’s likely that every article in the AZ Republic and other papers is probably a paid or sponsored piece. Just obey the law and you have nothing to worry about! The second sign was set the sign up off the roadway in the weeds. The Talivans are back on the 101 right under the 27th Ave Bridge in both East and West bound lanes. 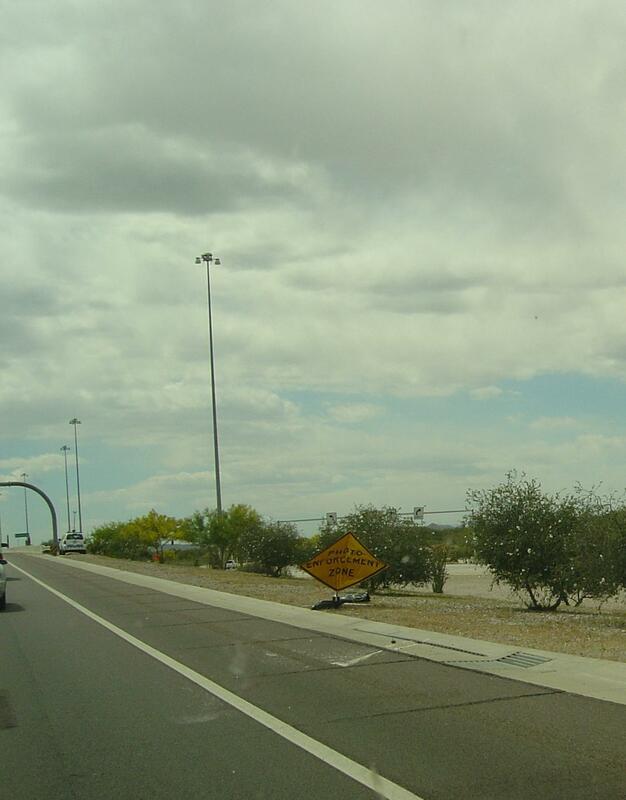 The one located in the Eastbound lanes is aprox 2000 feet after the fixed scamcam at the 28th Ave/I-17 exit. Milking the contract before it expires? Yes. I’ve also noticed regular DPS patrols have been beefed up lately. Those peons don’t have the moral backbone or fortitude to do the right thing. So desperate to protect their scam at any cost.. When the courts,cities and scamera companies are in collusion with one another, isn’t it called racketeering? ? 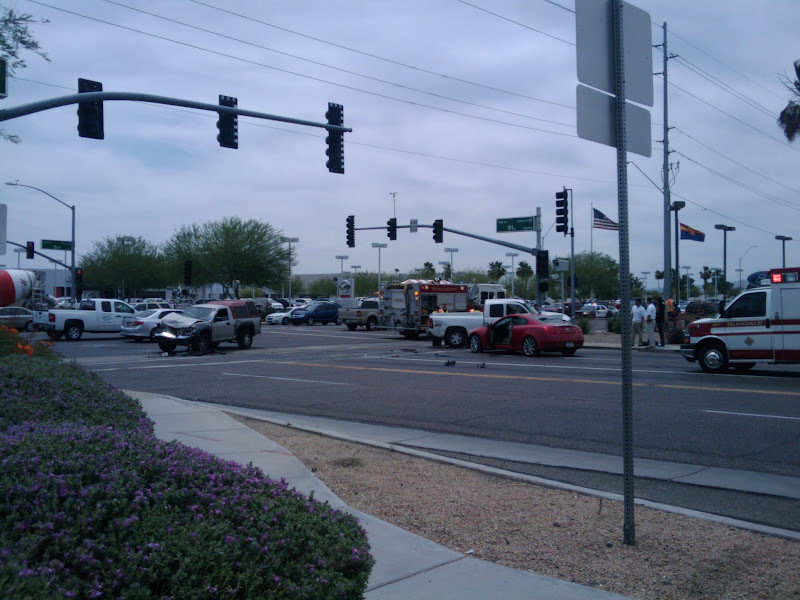 Accident at 91st Ave and Bell Rd. Cameras doing a great job keeping motorists safe! I guarantee they will find a way to make an “exception” for Redflex AZ because it will take away their revenue source. They will say “Oh it’s really an Aussie company” like that makes everything A OK.
Hehe, I didn’t see this before, I swear! redflex… red flecks… like blood spatter? What can we do about the massive oil spill? This is just criminal!! Karen Millen came from in England, Founded back in 1984.It is among the British effective lady brands. The gentleness and originality from discount Herve Leger dress will help you to catch more eyes concentrate on you. Just about all of what you point out happens to be supprisingly appropriate and that makes me ponder the reason why I had not looked at this with this light previously. This piece really did switch the light on for me as far as this specific issue goes. But there is actually one issue I am not truly too comfortable with and whilst I make an effort to reconcile that with the actual core theme of your point, allow me see what the rest of the visitors have to say.Nicely done. Keep up the fantastic piece of work, I read few posts on this website and I conceive that your website is really interesting and contains lots of excellent information.